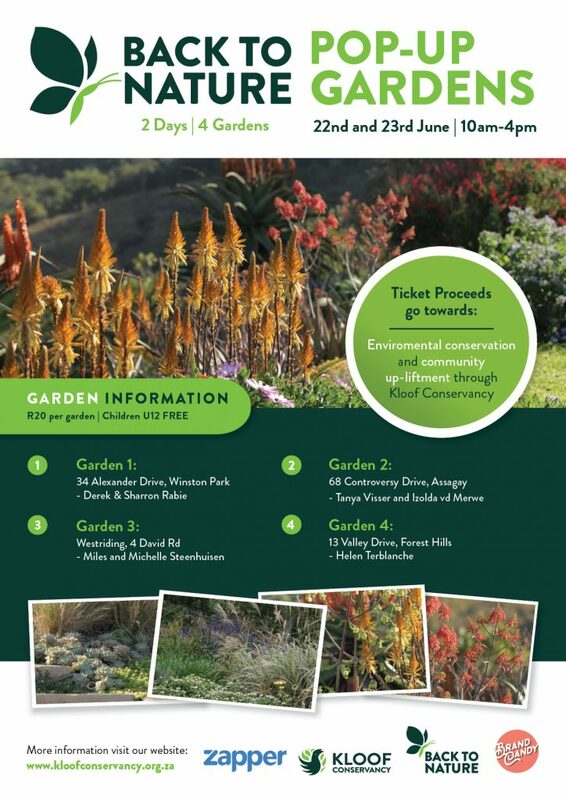 We have had an overwhelming response of disappointment at the cancellation of the 2019 Kloof Conservancy Indigenous Open Gardens and whilst it is too late to organise a full show we will be holding a “no-frills” Pop-Up Gardens event on the weekend of 22/23 June. Two of the gardens that were going to be on show were keen to do something and not wait for 2020 and two of our gardeners from last year’s show offered to go on show again so that there can be some event for garden enthusiasts this year. To avoid causing confusion with our regular open gardens show we will be branding this “no-frills event” as part of our Back-to-Nature initiative and it will be called the Back-to-Nature Pop-Up Gardens. We cannot confidently predict visitor numbers for this event so we will keep our expenses to the bare minimum. See the poster below – our website will be updated in the coming days with more details as the event develops.